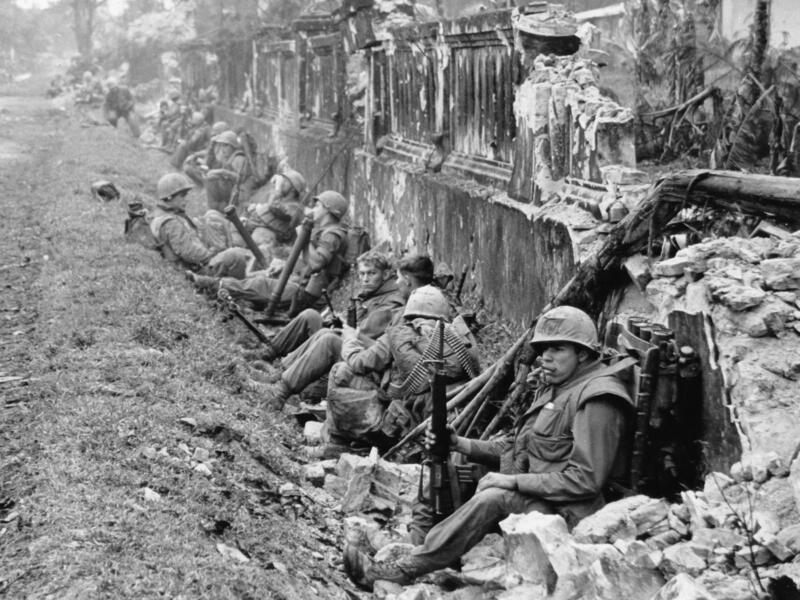 A unit of the 1st Battalion, 5th Marine Regiment, rests alongside a battered wall of Hue's imperial palace after a battle for the citadel in February 1968, during the Tet Offensive. 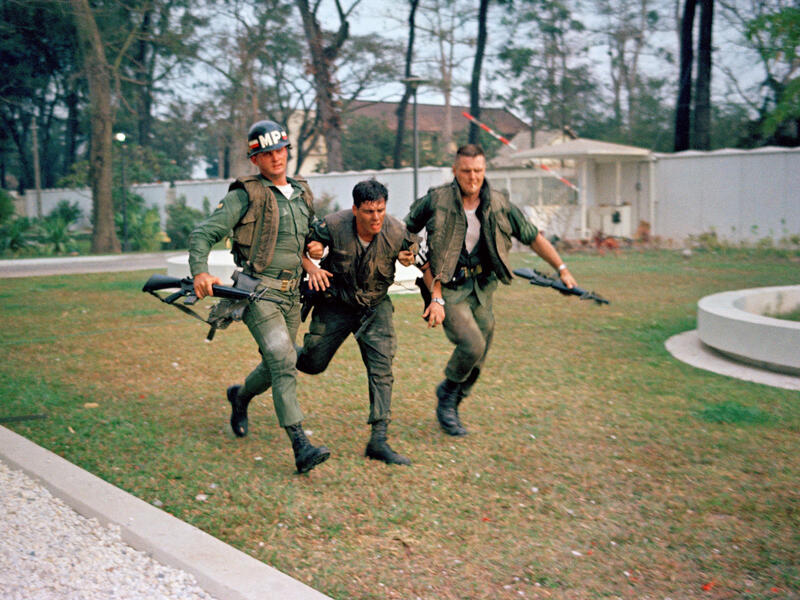 Two U.S. military policemen aid a wounded fellow MP during fighting in the U.S. Embassy compound in Saigon, at the beginning of the Tet Offensive. A Viet Cong suicide squad seized control of part of the compound and held it for about six hours before being killed or captured. 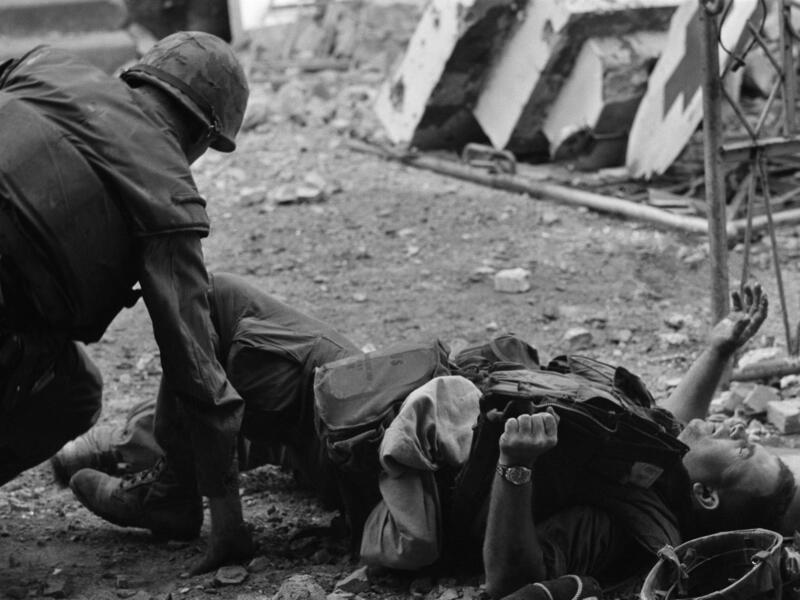 Keeping his head low against North Vietnamese snipers, a medical corpsman scurries to help a U.S. Marine in Hue street fighting during the Tet Offensive. A U.S. Marine carries a 155 mm shell at Khe Sanh in January 1968. North Vietnamese troops attacked the remote outpost to serve as a diversion in the leadup to the Tet Offensive. Members of Alpha Company of the 1st Battalion, 5th Marine Regiment, raise the U.S. flag on the south wall of the citadel in Hue after weeks of fierce fighting and heavy casualties. Looking back a half-century, to when they were young officers, their memories of the Battle of Hue are still fresh. "What I saw was probably the most intense ground fighting on a sustained basis over several days of any other period during the war," says Howard Prince, an Army captain who worked with South Vietnamese forces. "We were under fire, under heavy fire," says Jim Coolican, a Marine captain. Mike Downs, another Marine captain, recalls, "We didn't know where the enemy was, in which direction even." The enemy forces were everywhere. Inside houses and tunnels and in the sewer system, and they captured the citadel, a massive castlelike expanse in this city that was once the imperial capital, north of Saigon. It was the bloodiest battle of the Tet Offensive and also the entire war — and it all took American officials completely by surprise, says author Mark Bowden. "You had the incredible rose-colored reports coming from Gen. William Westmoreland, who was the American commander in Vietnam," says Bowden, who wrote the recent book Hue 1968. "[He was] assuring the American people that the end was near, that the enemy was really only capable of small kinds of ambushes in the far reaches of the country." But then came Tet. 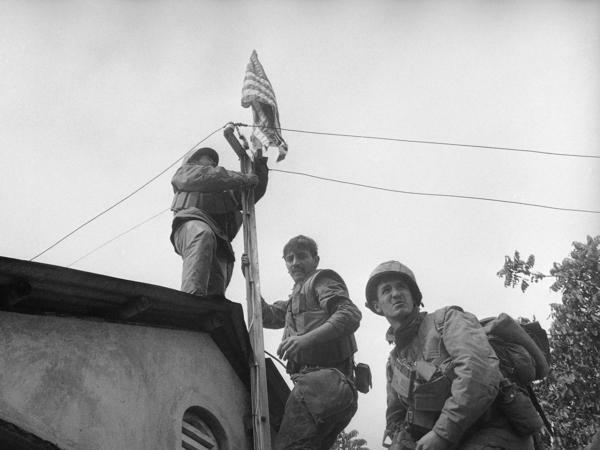 North Vietnamese troops and their Viet Cong allies swept throughout cities and towns, into military bases, even breaching the walls of the U.S. Embassy grounds in Saigon. Back in Washington, President Lyndon Johnson called his defense secretary, Robert McNamara, and asked for an explanation. McNamara told him that the American people would realize that the enemy forces were stronger than they had been told, that the Pentagon was searching for targets but the Vietnamese enemies were still a "substantial force." A substantial force. But just six weeks earlier, a top White House official had told New York Times reporter Gene Roberts the war was already over. Roberts was heading off to Vietnam, so national security adviser Walt Rostow gave him a story idea. He told Roberts about a new U.S. agricultural program, Roberts recalls, "which would double the rice yields in Vietnam and would win the peace now that Americans had won the war." Far from winning, the Americans were barely holding on in Hue. Roberts saw terrified refugees, wounded Marines and heavy gunfire. His first story said the Marines controlled just two blocks of the city. Reinforcements were needed — not just troops but artillery. That was slow in coming. Coolican, the Marine captain, said his own military superiors didn't understand how desperate the Marines were. The Americans were badly outnumbered. "The reaction we got — and I'm paraphrasing now, but the reaction we got was that we were overreacting. It isn't that bad," remembers Coolican. More reporters showed up at Hue, including some from NBC. The pictures showed a desperate scene, talking to a Marine under fire who said he just wanted to go home. Still, Westmoreland downplayed the situation, telling reporters the real enemy objective was a large and remote Marine base at Khe Sanh. "In my opinion," Westmoreland told reporters, "this is diversionary to [the enemy's] main effort, which he had planned to take place in Quang Tri Province, from Laos toward Khe Sanh and across the demilitarized zone." But Prince, a young Army officer fighting at Hue, said Westmoreland had it backward: Khe Sanh was the diversion. "Westmoreland and his staff, the people who were advising him, became fixated on Khe Sanh," says Prince, "to the point where they simply were not capable of entertaining other information." Others were willing to entertain the importance of the Tet Offensive. Among them was Walter Cronkite, the CBS anchor who arrived in Hue and quickly realized he had been deceived by his official sources back in Washington. What Cronkite saw on the ground led him to go on TV and say it was time for the U.S. to end the war. "The only rational way out then," Cronkite said to a national audience, "will be to negotiate not as victims but as an honorable people who lived up to their pledge to defend democracy and did the best they could." Johnson is said to have told an aide, "If I've lost Cronkite, I've lost middle America." And maybe more than that. Bowden says Tet spurred not just a lack of trust about Vietnam policy but a more general disregard for government officials that continues to this day. "On the heels of Hue," says Bowden, "on the heels of Tet then came the Pentagon Papers, came the Watergate break-in, a series of kind of catastrophic events in terms of the public's perception of its own leaders." A month after the Tet Offensive, Johnson went on TV and said he would press for peace, stop the bombing in North Vietnam. Then, he dropped his own bombshell: He would not seek another term as president. Prince watched it from his hospital bed in Texas, recovering from wounds he suffered at Hue. "I was ready to throw a bedpan at the television set," he recalls, "because to me what that was was an admission of defeat and a denial of the sacrifice that all those young men had made and that I had made." The Tet Offensive was an American military victory, says Prince. And Johnson should have taken the fight to North Vietnam and gone after the enemy's safe havens in Laos and Cambodia. "We're doing the same thing today with the Taliban in Afghanistan," Prince says. "We're allowing you to run over into the borderlands in Pakistan and do the same thing." Bowden agrees that even today, there are military parallels to the Vietnam War. "We often find ourselves mired in situations where we don't have the cultural understanding, we don't have the historical understanding," Bowden says. "We can't gain the support of the people whether it's in Iraq or Afghanistan, and it stems from a kind of an arrogance and a general ignorance." For his part, Downs, another young Marine officer, will say only that he and his men did their best. This week Downs will remember those from Fox Company who were killed or wounded. Their names are carefully written in a small notebook he carried during those days a half-century ago. And he begins to read the names. "The killed were, I think he was a [private first class], Stanley Murdock. D.I. Collins. A corpsman by the name of Gosselin, Doc Gosselin. Cristobal Figueroa-Perez." And Downs says they were killed in just the first few hours of the Battle of Hue, which would last for weeks. During that time the casualty rate for his company reached around 60 percent killed or wounded, a rate similar to the D-Day landings at Normandy during World War II. All this year, we are looking at the events of 1968 that continue to shape our world today. It was 50 years ago this week when thousands of North Vietnamese troops and their Viet Cong allies launched an audacious attack sweeping into cities throughout South Vietnam, even slipping through the gates of the American embassy in Saigon. This was a stealthy, coordinated attack that became known as the Tet Offensive. NPR's Tom Bowman reports that the offensive solidified American opposition to the Vietnam War and began the slow erosion of trust that Americans have in their government leaders. JIM COOLICAN: We were under fire - under heavy fire. TOM BOWMAN, BYLINE: Howard Prince and Mike Downs and Jim Coolican were all young American officers caught up in the fight of their lives. They were in the city of Hue, the old imperial capital north of Saigon. It was the bloodiest battle of the Tet Offensive and also the entire war. And it all took American officials completely by surprise, says author Mark Bowden. MARK BOWDEN: You had the incredibly rose-colored reports coming from General William Westmoreland - who was the American commander in Vietnam - assuring the American people that the end was near, that the enemy was really only capable of small kind of ambushes in the far reaches of the country. BOWMAN: But then came Tet. Enemy troops breached the U.S. embassy grounds in Saigon. UNIDENTIFIED MAN #1: Viet Cong snipers and suicide commandos were holed up inside the embassy compound. BOWMAN: Back in Washington, Lyndon Johnson called his defense secretary, Robert McNamara, and asked for an explanation. LYNDON JOHNSON: What was your evaluation? ROBERT MCNAMARA: I think it shows two things, Mr. President - first, that they have more power than some credit them with. I don't think it's a last gasp action. They will remain a substantial force. BOWMAN: A substantial force. But just six weeks earlier, a top White House official told New York Times reporter Gene Roberts the war was already over. Roberts was heading off to Vietnam, so National Security Adviser Walt Rostow gave him a tip. It was a new U.S. agricultural program Roberts recall being told. GENE ROBERTS: Which would double the rice yields in Vietnam and would win the peace now that Americans had won the war. BOWMAN: Far from winning, the Americans were barely holding on to Hue. Gene Roberts saw terrified refugees, wounded Marines and heavy gunfire. His first story said the Marines controlled just two blocks. Reinforcements were needed, not just troops but artillery. That was slow in coming. Jim Coolican, the Marine captain, said his own military superiors didn't understand how desperate they were. The Americans were badly outnumbered. COOLICAN: And the reaction we've got - and I'm paraphrasing now - but the reaction we got was that we were overreacting. This isn't that bad. BOWMAN: More reporters showed up at Hue, including some from NBC. The pictures showed a terrifying scene. UNIDENTIFIED MAN #2: What's the hardest part of it? UNIDENTIFIED MAN #3: Not knowing where they are. That's the worst thing. Riding around, they're running in sewers, in the gutters - anywhere, could be anywhere - just hope you stay alive from day to day. BOWMAN: Still, General Westmoreland downplayed the situation, telling reporters the real enemy objective was a large and remote Marine base at Khe Sanh. 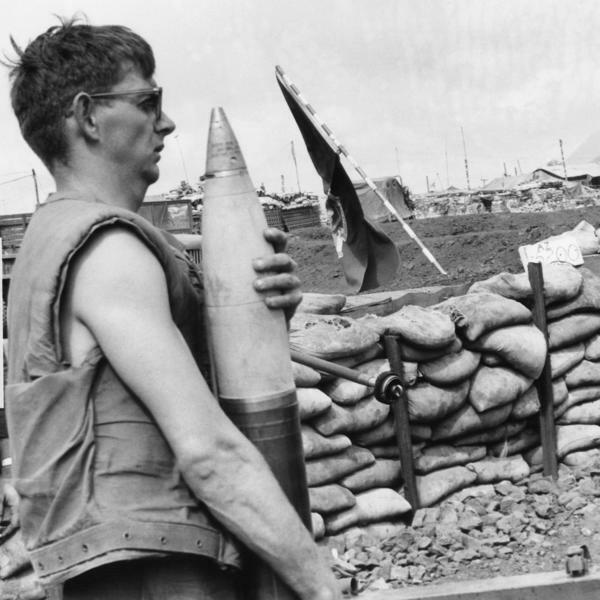 WILLIAM WESTMORELAND: In my opinion, this is diversionary to his main effort, which he had planned to take place in Quang Tri Province from Laos toward Khe Sanh and across the demilitarized zone. BOWMAN: But Howard Prince, the young Army officer fighting at Hue, said Westmoreland headed backwards. Khe Sanh was the diversion. PRINCE: Westmoreland and his staff, the people who were advising him, became fixated on Khe Sanh to the point where they simply were not capable of entertaining other information. BOWMAN: Others were willing to entertain the importance of the Tet Offensive. Among them was Walter Cronkite, the CBS anchor who arrived in Hue and quickly realized he'd been deceived by his official sources back in Washington. What Cronkite saw on the ground led him to say it was time for the U.S. to end the war. WALTER CRONKITE: The only rational way out then will be to negotiate not as victims but as an honorable people who lived up to their pledge to defend democracy and did the best they could. BOWMAN: Johnson is said to have told an aide - if I've lost Cronkite, I've lost middle America. And maybe more than that. Bowden says Tet spurred not just a lack of trust about Vietnam policy but a more general disregard for government officials that continues to this day. BOWDEN: On the heels of Hue, on the heels of Tet then came the Pentagon Papers, came the Watergate break-in - you know, a series of kind of catastrophic events in terms of the public's perception of its own leaders. BOWMAN: A month after the Tet Offensive, Johnson went on TV and said he would press for peace, stop the bombing in North Vietnam. Then he dropped his own bombshell. JOHNSON: I shall not seek, and I will not accept the nomination of my party for another term as your president. BOWMAN: Howard Prince watched it from his hospital bed in Texas recovering from wounds he suffered at Hue. PRINCE: I was ready to throw a bedpan at the television set because, to me, what that was was an admission of defeat and the denial of the sacrifice that all those young men have made and that I had made. BOWMAN: The Tet Offensive was an American military victory, says Prince. And Johnson should've taken the fight to North Vietnam, gone after the enemy safe havens in Laos and Cambodia. PRINCE: We're doing the same thing today with the Taliban in Afghanistan. We're allowing you to run over into the borderlands in Pakistan and do the same thing. BOWMAN: Bowden agrees that even today there are military parallels to what he wrote in his recent book, "Hue 1968." BOWDEN: We often find ourselves mired in situations where we don't have the cultural understanding. We don't have the historical understanding. We can't gain the support of the people, whether it's in Iraq or Afghanistan. And it stems from a kind of an arrogance and a general ignorance. BOWMAN: For his part, Mark Downs, another young Marine officer, will only say he and his men did their best. This week, Downs will remember those from Fox Company who were killed or wounded. BOWMAN: Their names are carefully written in a small notebook he carried during those days a half century ago. Tom Bowman, NPR News, Washington. (SOUNDBITE OF GLENN CARTER'S "(SITTIN' ON) THE DOCK OF THE BAY") Transcript provided by NPR, Copyright NPR.